Come to New Zealand, the invitation said. Come to Eastland and the Bay of Plenty. Come and discover old European history and even older Maori culture. Come discover great outdoor adventure and fine wines. Come discover where New Zealand’s tourism industry started. And we discovered it all. 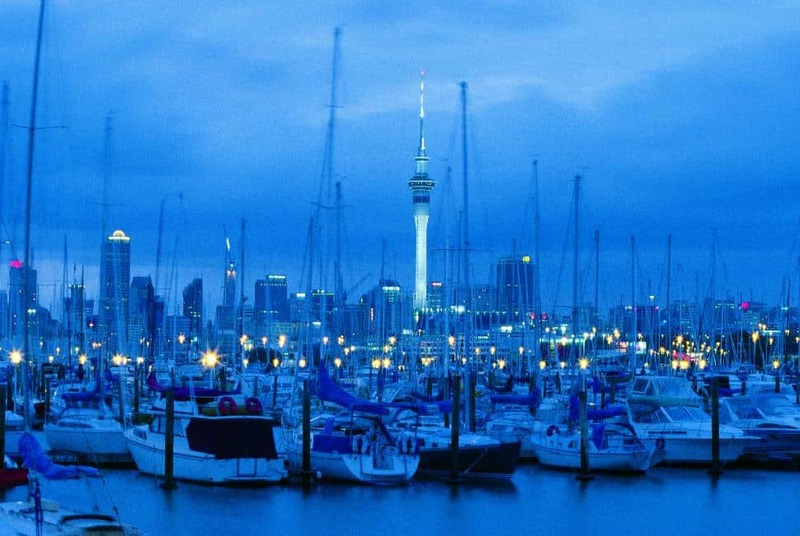 Our trip started with a stopover in Auckland, the major North American gateway to New Zealand. The City of Sails has so much to offer, it’s hard to choose what to do first. Clients can enjoy a thriving arts scene with galleries, museums and spectacular events to attend. They can get out on the water, with sailing and cruising excursions. The city boasts not one, but three harbours. Foodies revel in the mix of fresh local foods at farmers markets, the wide range of dining options and the local fine wines. Adventurers find dolphin encounters, hiking, biking and world-renowned birdlife, while sports fans head to more than 40 golf courses, or the horse or motor racing tracks. Your clients can even take a walking tour of the city and see the sights through the eyes of their Maori guide. I only had an afternoon so chose a tour on the Auckland Explorer Bus, an English double-decker bus offering hop-on/hop-off sightseeing of the 14 biggest attractions in Auckland including Kelly Tarlton’s Antarctic Encounter/Underwater Adventure, Auckland Museum, SKYCITY, the Auckland Zoo and Mount Eden. About an hour’s flight from Auckland, Gisborne is the gateway to Eastland, New Zealand’s land of firsts. Eastland is the place where the first Polynesian migration canoes landed, where Captain James Cook made his first landfall and where the Maori and Europeans first encountered each other. And, Gisborne is Eastland’s largest community and the first city in the world to see the sunrise every day. The city also has a reputation for great food, wine and surf beaches. 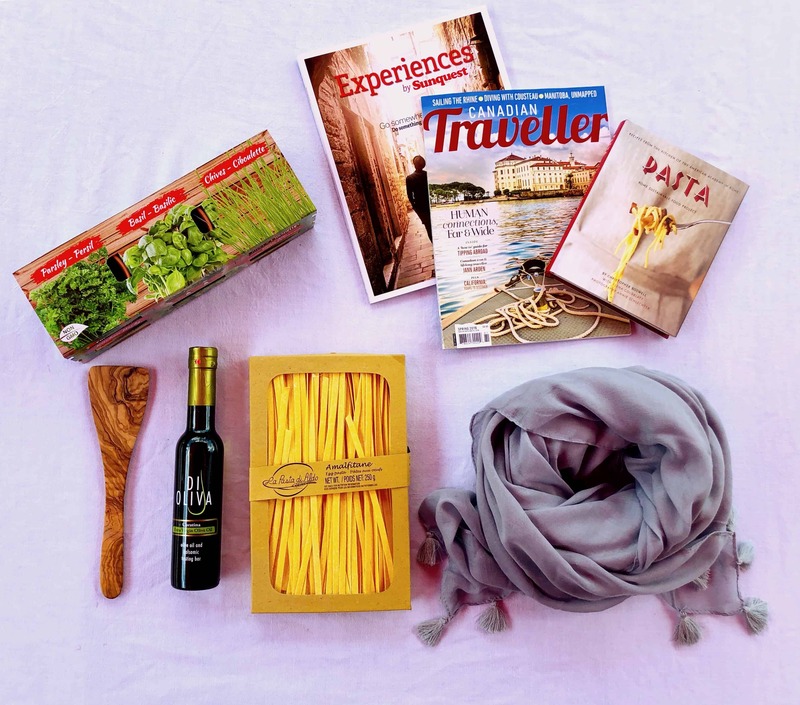 Fine cafes and restaurants offer up local produce and the daily catch, fresh from the sea. Gisborne is also the unofficial “Chardonnay Capital of New Zealand”. Clients can head out onto the wine trail and visit some of the country’s top chardonnay, gewürztraminer and viognier producers. And sample, of course. It might be best to leave the driving to one of several operators that offer custom tours tailored for individuals or groups. History is all around in Gisborne. 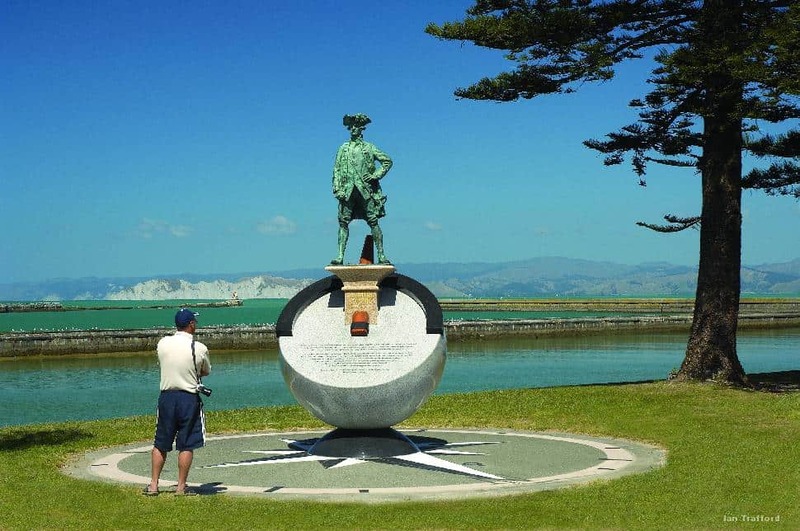 The Tairawhiti Heritage Trail passes many points of interest, including the first landing point in New Zealand for both early Polynesian settlers and Captain Cook; and the Tairawhiti Museum & Arts Centre which houses a fine collection of European and Maori artifacts and an extensive photo collection. Outside Gisborne, the untamed mountains and lakes of Te Urewera National Park, the Raukumara Ranges and all the lands in between offer plenty of outdoor recreational challenges. Adventurers can book fishing charters (it is rumoured that New Zealand’s best trout fishing rivers are here, as well as the best sea fishing waters), whitewater rafting excursions or horse treks. Clients can also go it alone on foot or on bikes, or test their paddling skills in local waters. The Bay of Plenty region boasts an irresistible mix of coastal lifestyle, adventure activities and great dining experiences. After all, the name Bay of Plenty pays tribute to the region's ability to produce great food. Around the city of Tauranga are swathes of orchards and gardens growing everything from kiwifruit and citrus fruit to avocados and culinary herbs. Surfers head to the spectacular local beaches year round, particularly the waters around Mount Maunganui near Tauranga. Divers and anglers head to the offshore islands, reefs and fishing grounds. Uniquely local adventure include tours of the marine volcano White Island, blokarting (land sailing), sky diving and dolphin encounters. Tauranga is the largest city in the Bay of Plenty and one of the fastest growing population centres in the country. Downtown Tauranga has several historically significant areas to view during a scenic walk around the area. The Strand waterfront area has undergone a major redevelopment in the past few years, and is home to a number of cafés, restaurants, pubs and nightclubs, as well as a range of accommodation options. Fishing, sailing, diving and dolphin tours are easy to arrange for your clients. With its unique volcanic landscape, living Maori culture, natural hot springs and plenty of options for adventure, Rotorua is one of New Zealand's most famous destinations. The region was the birthplace of New Zealand tourism in the 1800s, when people flocked here from around the world to see the amazing Pink and White Terraces – vast, naturally formed silica terraces that cascaded into a volcanic lake. The Te Arawa people were their local guides. The terraces were destroyed in the 1886 Mt Tarawera eruption, but Rotorua's fame as a fascinating travel destination continued to grow. 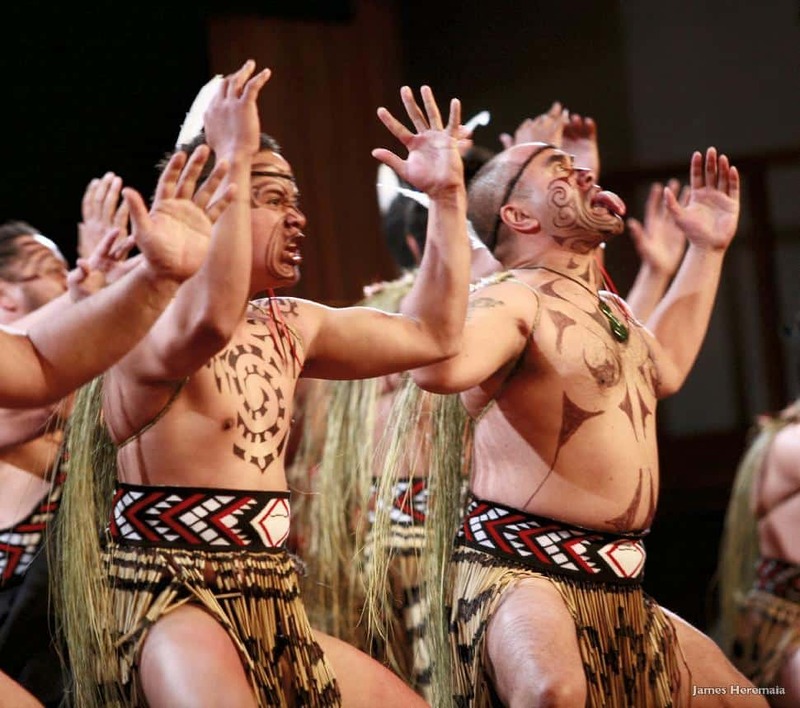 Tourism New Zealand/James HeremaiaFor a good look and understanding of the Maori culture clients should check out Te Puia, New Zealand’s Maori Cultural Centre; Tamaki Maori Village; and the New Zealand Maori Arts and Crafts Institute. As well as its surprising crater, mountain and lake landscape, Rotorua is memorable for striking Tudor-style architecture and beautiful public parks. The farmland around city is some of the most fertile in New Zealand. Watching a sheep show or staying on a working farm is a great way to get a different view of the region. Food, Film & Far-Out Fun, December, 2006. North To Adventure, June, 2006. 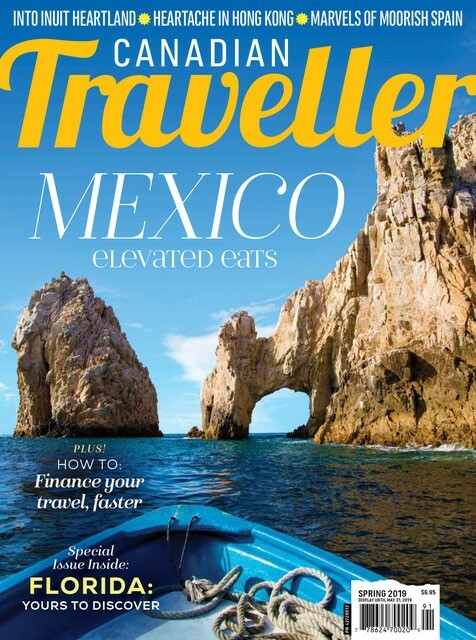 Tourism New Zealand/Ian Trafford• Whalerider Tour. 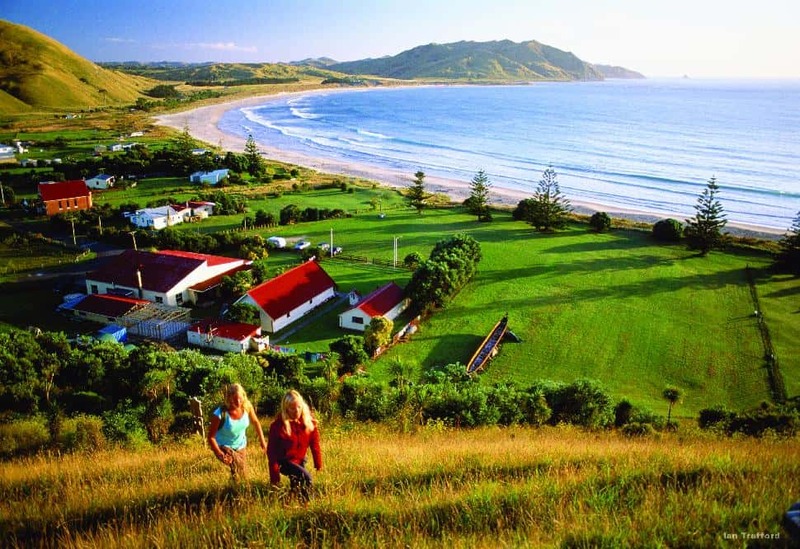 Whangara is a lovely seaside Maori community about 30 kilometres from Gisborne, where the movie Whale Rider was filmed. Take a guided tour of the village with Hone Taumaunu, a cultural consultant on the picture. Visit the home where much of the filming took place and listen to the story that inspired the film. 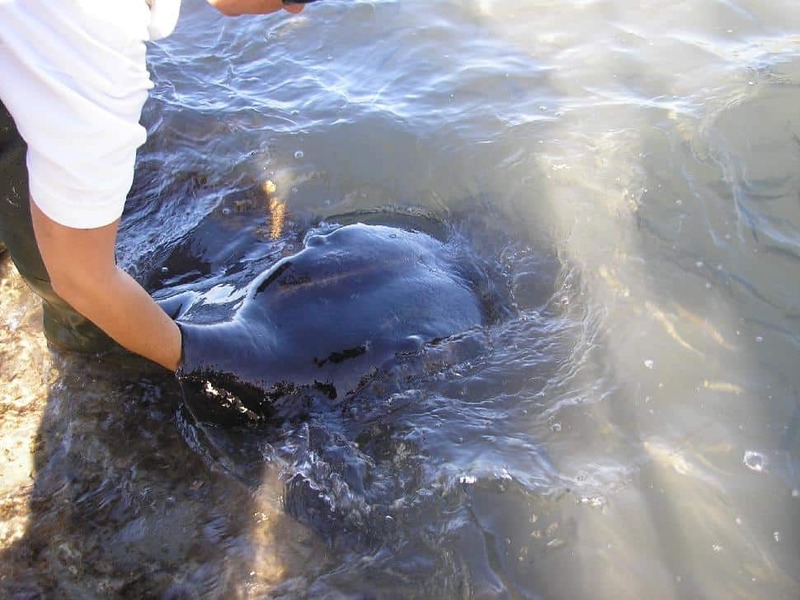 • Wild Stingray Feeding. A few minutes up the road from Janice StrongWhangara, Dive Tatapouri offers the chance to walk the reef of Tatapouri Bay and hand feed wild eagle and sting rays. We were kitted out with chest waders and walking sticks, then followed the guide to the water’s edge where the rays came right up to us. Janice Strong• White Island Tour. 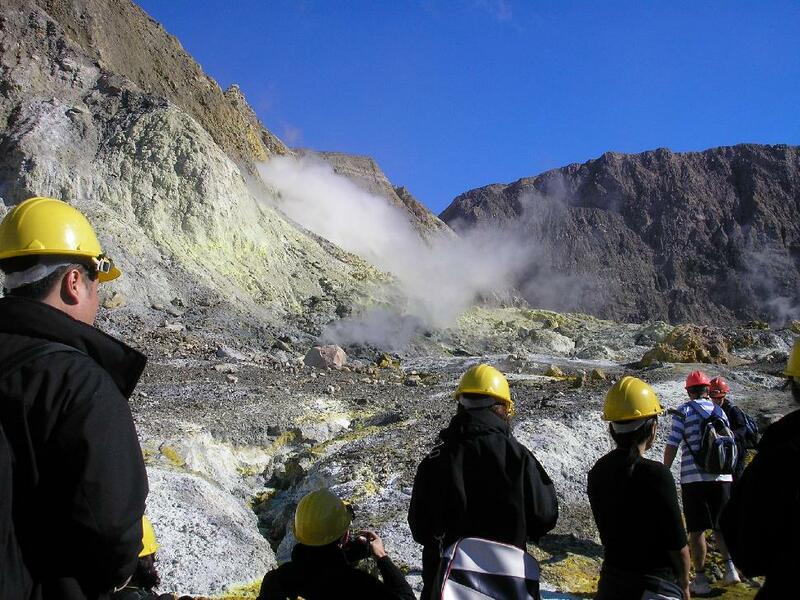 Our tour started with a 90-minute cruise to White Island, followed by a guided tour of the live marine volcano. We donned hard hats and gas masks and passed the remains of the old sulphur mining factory, passed boiling mud pits and venture right up to the main crater’s edge. There are also tours that reach the island by helicopter. Waimarino.com• Glow Worm Tour. Our guided excursion began at dusk with snacks and drinks on the edge of a lake where we donned safety equipment and teamed up to man double kayaks. 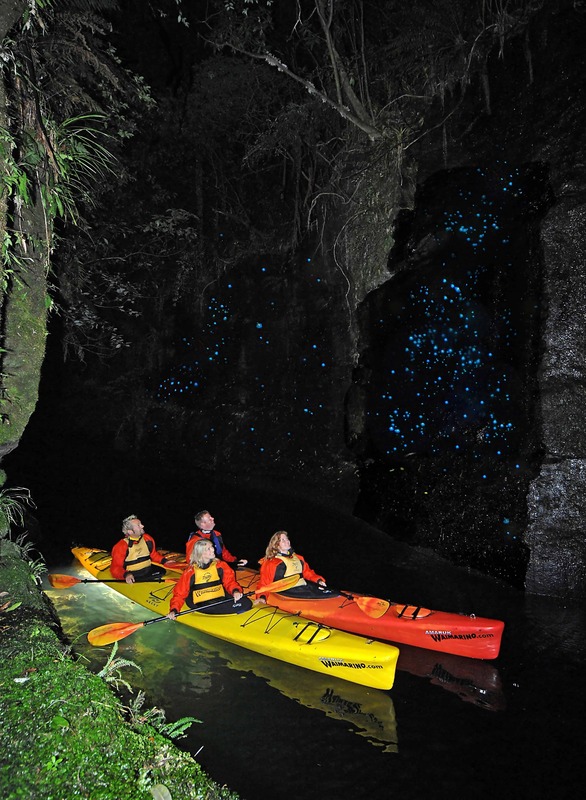 Paddling along a stream we entered a canyon and were enchanted by the glowworms on the canyon walls. • Air New Zealand launched non-stop direct service between Vancouver and Auckland, New Zealand in November of last year. The service provides three non-stop flights each week between Vancouver and Auckland November through March and July through August and twice-weekly flights for the remaining months of the year, aboard a Boeing 777-200ER featuring lie-flat beds, vast entertainment options and award-winning food and wine. “We are committed to creating at least one new long-haul international destination each year and Vancouver proved an ideal strategic fit, due in part to Canada's thriving economy,” said Roger Poulton, Air New Zealand Vice President - the Americas. “We anticipate our Canadian customers will appreciate that the service is a fast and convenient route to many Australian destinations too,” said Poulton. The New Zealand-born chef leapt at the chance to collaborate with Air New Zealand on its in-flight menu for the new route. “My opportunity was to create meal options that showcase Pacific Rim flavours by drawing on my experiences and the produce offered in New Zealand and Canada,” he says. • Also in December, Air New Zealand announced that it has been recognized by Business Traveler magazine as the “Best Airline to the South Pacific, Australia, and New Zealand” in 2007. Through an aggressive strategy to continuously upgrade its aircraft fleet and onboard amenities, Air New Zealand secured its place as the most innovative and attentive airline serving popular destinations in the South Pacific, such as Auckland, Sydney, Melbourne and a number of Pacific island destinations. Air New Zealand Business Premier cabins offer customers luxurious comfort with revolutionary lie-flat seats – 22-inch-wide leather armchairs that convert into 6-foot, 7.5-inch beds featuring an ottoman footrest that doubles as a visitor’s seat. The airline also has in-flight entertainment that provides customers with in-seat power, as well as individual high resolution 10.4-inch screens with on-demand entertainment featuring a wide range of audio and video options including the most recent blockbuster movies, TV programs and exclusive audio programs that allow customers to watch or listen to what they want, when they want.